Following is a collection of newspaper articles, published primarily in the Dallas Morning News over the past 60 years, relating to events, features and stories on Appian Way. If you have any additional stories or photographs of the time, please drop us a note and we will be happy to include your material. Madame Rita (or Gita) Barry-Orlova was guest of Mrs. E.R. Schoen, 321 Appian Way where she resided during the production of "As You Like It" at the Dallas Little Theater in 1939. 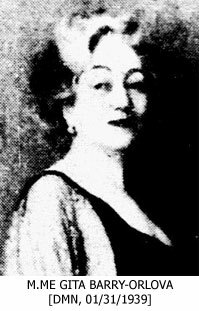 A Californian by birth, Madame Barry-Orlova, lyric tragedienne, dramatic recitalist, lecturer and author was educated at the London University and the Sorbonne. She played with Paul Cazeneuve in France in such tragic roles as Monna Vanna and Francesca da Rimini. In London she appeared with Sir Herbert Tree and Sir George Alexander in the works of Shakespeare, including "As You Like It", in which she played Rosalind. She was presented at many of the courts of Europe. Before the war, she formed her own company and toured Europe. In Russia she met and married a Russian nobleman, and stayed there for the duration of the war. During the revolution, she was a surgical nurse in the grand ballroom of the Tzar, which at that time had been converted into a hospital. Returning to America, she played with William A. Brady in New York and appeared for four years in John Colton's Shanghai Gesture. She followed this with several motion pictures under the direction of J. Stuart Blackton, and has had her own little theater group for out-door productions in California and New Jersey, specializing in Shakespearean works. Among her published works, a book dealing with the visit of John Paul Jones at the Court of Catherine the Great; The Unbarred Highway, a morality play dramatizing The Seven Valley of Bahaullah and first produced in London in 1937, and The Sun Arises, a story of Persia. “Appointment Only Good Until November Election - O.H. Vickrey Sr., South Oak Cliff realtor and insurance man, will be named Saturday as interim successor to the late County Commissioner John Rowland. The district over which Vickrey will be Commissioner comprises the south-southeast quarter of Dallas County. Besides South Dallas and much of South Oak Cliff, it includes Pleasant Grove, Seagoville, Lancaster, Wilmer, and Hutchins. Vickrey has lived in Dallas County all his life. He was born on Worth Street, attended schools in Dallas and Grand Prairie, and was a dirt contractor before going into the real estate business. He has been doing business in South Oak Cliff for about a quarter century. With his two sons, Harold and Thornton, he operates the O.H. Vickrey & Sons firm. He lives at 130 Appian Way. 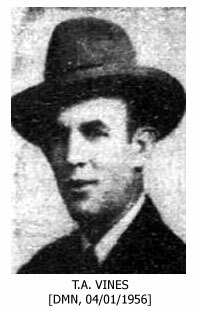 He served three terms on the City of Dallas zoning board of adjustment under Mayors Woodall Rodgers and Jimmie Temple, and was on the rationing board for Oak Cliff during World War II.” (© Dallas Morning News, June 21, 1952, Sec. I, Page 1). “T.A. Vines, Constable of Precinct 7, has been names Oak Cliff's Man of the Month for April. Selection was made by the editors of the Magazine Oak Cliff, official publication of the Oak Cliff Chamber of Commerce. Born on a farm in Ellis County, Vines as a boy picked 400 pounds of cotton a day. His grandfather, the Rev. F.M. Vines, was a Baptist Minister. His father, Alonzo L. Vines, taught religious music in Ellis County all his life. Vines moved to Ennis at the age of five. He grew up and attended public school in Ennis. Vines came to Dallas when a young man and first worked for the Oriental Cleaning Company, later entering business for himself. At first he located in downtown Dallas; later he established the Beckley Cleaners. Throughout his adult life Vines has taken an active part in civic and religious work. Her gardening did not stop at planting seeds and trees and shrubs and then sitting back and watching them grow. She studied the Johnson grass-covered, rocky hill that slanted upward from the back of the house, then set to work with pencil and paper, planning drastic changes. The hillside garden was chiefly of shale. When rain came - and there was almost none at that time -, it ran off the rocky terrain swiftly. Three Terraced Levels - Mrs. Clayton knew her first step must be terracing. She started with the level outside the back door, and then built two higher ones leading to the back of the lot. 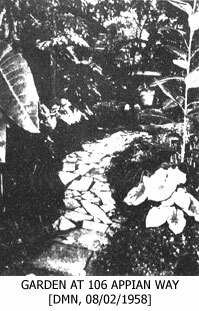 She used marble flagstones for a patio on the first level and for a winding walk to the one above and to the greenhouse door. By Larry Grove - “Mrs. J.L. Clayton's back yard at 106 Appian WAY is a veritable forest where squirrels and opossums pad about and birds fly blissfully ignorant of most of the things that worry people. Yet not all is well adjusted among our little feathery friends. A zany cardinal beats his brains out flying headlong into his reflection on a window panel; his girl friend whistles approvingly from a fence nearby. “This happens every afternoon,” said Mrs. Clayton. “Early in the afternoon, he fights his reflection at the top of the window. By late afternoon, he is pooped but he fights his reflection at the lower part of the window. The important thing here,” said Mrs. Clayton “is that the male impresses the female.” There is also about the premises, a pigeon named Sadie. Sadie, says Mrs. Clayton, does not know she is a pigeon. Currently Sadie is sitting on a nest of onions that one day may hatch.